While not technically a game, the XBand modem was certainly a unique piece of hardware that deserves recognition. The XBand itself was a large purple cartridge that stuck out of your Super NES by about twice the amount that a regular cartridge did, and you put a game on the top of it, creating an impressive tower of plastic. 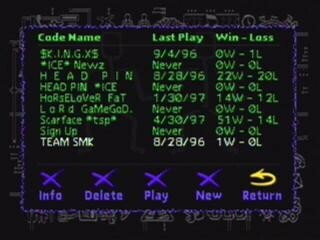 Once you turned on the system, you had several options at your disposal: a buddy list, newsletters, email, and a matchup service, plus several more sundry activities that I’m not going to go into here. When I was in the queue, folks would dial my number to play. If I didn’t tell everyone in the house what I was doing, there was a near 100% chance that someone would answer the phone, completely screwing up the connection. Each match you won gave you a certain amount of points, these points weren’t really for anything except for giving you some meaningless ranking on your profile screen that only you could see. Unless, that is, you had access to the Internet. The site, which is now long-defunct, allowed you to look up players by name and see their stats. It was pretty bare-bones, but pretty useful for seeing if the person that trounced you in Game X was a veteran or just getting started. There was a fair selection of games supported by the service, though the only ones I ever played were Super Mario Kart, Kirby’s Avalanche, Killer Instinct, and Super Street Fighter II. There were also several sports games like Ken Griffey Jr. Presents Major League Baseball and NBA Jam, but I couldn’t imagine tying up the phone line for the length of time it would take to complete just one matchup in those games. Late in the life of the service, support for Super Mario World and Legend of Zelda A Link to the Past was added, though neither allowed you to play the games. Mario let you dial up a random user and chat with them with the built in chat interface (think Instant Messenger with only one person available at a time), and Zelda allowed you to compete with someone else in a silly maze game. These late additions, in hindsight, were probably meant to bolster the use of the system. Even at its peak, which is right about when I joined, I had trouble finding people to play with. There were virtually no other players in my local area, there were two other then the three I made buy one, and searching nationwide took upwards of 10 minutes to find an opponent, if I could find one at all. After a couple years, the service tanked and the company was absorbed by MPlayer, who was, in turn absorbed by GameSpy. The system was immediately shut down, and now exists only in the memories of those that played it. If you look hard enough, though, you’ll find the occasional player whose eyes will light up at the mention of the ground-breaking service. 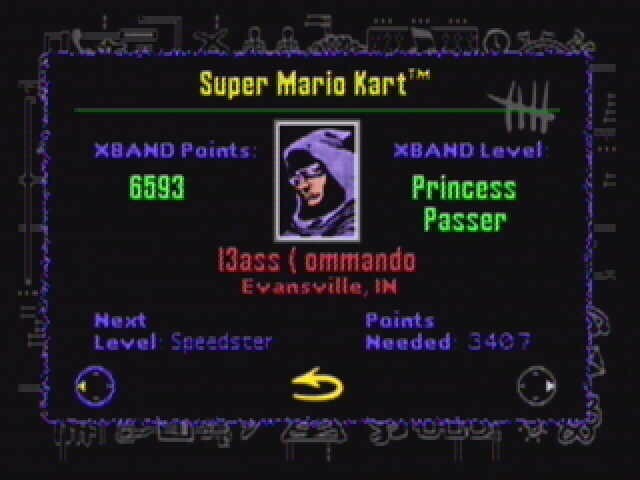 This entry was posted on Friday, August 10th, 2007 at 12:51 pm	and is filed under Genesis, Super NES. You can follow any responses to this entry through the RSS 2.0 feed. You can leave a response, or trackback from your own site. Xband rocked, yes it had its faults, but no online community of today has ever been able to accomplish that type of community since..